Despite what Jews and Christians--and indeed most people--believe, the ancient Israelites venerated several deities besides the Old Testament god Yahweh, including the goddess Asherah, Yahweh’s wife, who was worshipped openly in the Jerusalem Temple. After the reforms of King Josiah and Prophet Jeremiah, the religion recognized Yahweh alone, and history was rewritten to make it appear that it had always been that way. The worship of Asherah and other goddesses was now heresy, and so the status of women was downgraded and they were blamed for God’s wrath. However, as Lynn Picknett and Clive Prince reveal, the spiritual legacy of the Jewish goddesses and the Sacred Feminine lives on. Drawing on historical research, they examine how goddess worship thrived in early Judaism and included a pantheon of goddesses. They share new evidence for an earlier form of Hebrew worship that prayed to both male and female gods, including a 20th-century archaeological discovery of a Hebrew temple dedicated to both Yahweh and the goddess Anat. Uncovering the Sacred Feminine in early Christianity, the authors show how, in the first century AD, both Jesus and his great rival, Simon Magus, were attempting to restore the goddess-worshipping religion of the Israelites. The authors reveal how both men accorded great honor to the women they adored and who traveled with them as priestesses, Jesus’s Mary Magdalene and Simon’s Helen. But, as had happened centuries before, the Church rewrote history to erase the feminine side of the faith, deliberately ignoring Jesus’s real message and again condemning women to marginalization and worse. 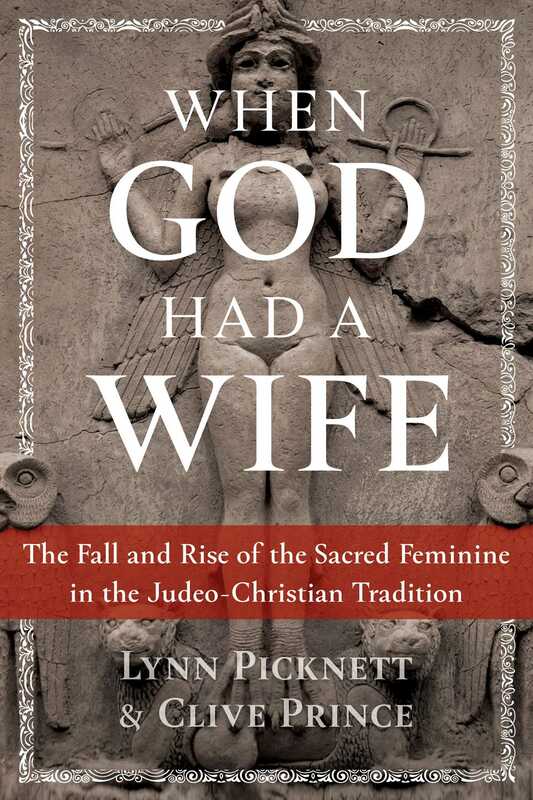 Providing all the necessary evidence to restore the goddess to both Judaism and Christianity, Picknett and Prince expose the disastrous consequences of the suppression of the feminine from these two great religions and reveal how we have been collectively and instinctively craving the return of the Sacred Feminine for millennia. In 1967 a ground-breaking book by the Hungarian-born American professor of anthropology Raphael Patai was published. The Hebrew Goddess presented landmark evidence for female forms of the divine - what is now known as the sacred feminine - in various Judaic traditions. Soberly, it set out to show that, despite the traditional presentation of the Jewish God as unwaveringly male, the expression of female divinity had always been present in Judaism. Although concentrating on Judaism from the last centuries BCE to the Middle Ages, Patai’s book opened with the status of goddesses in ancient Israel and the era of the kingdoms - a startling, often even shocking concept in the 60s, and which still has the potential to unsettle even now. Since then, however, many of his conclusions and speculations, based on a close reading of the Hebrew Bible and comparisons to other religions, have been vindicated by archeological and other discoveries. We personally owe him a great debt, for he opened our eyes to what is, of course, to most believers, a complete shake-up of Jewish religious history. Goddesses - in Judaism? This was obviously potentially explosive stuff, but - as frequently happens with radical challenges to the academic Establishment - at the time it sank almost without trace. Few other biblical scholars or archeologists acknowledged Patai’s prescience. He is rarely mentioned, even today. In the Hebrew Bible, when discussing the Israelites’ “backsliding” to the worship of other gods, the word asherah occurs some 40 times, sometimes in conjunction with Baal. Clearly this refers to a deity at the center of some highly dubious cult, at least as far as the writers were concerned. A feminine noun, sometimes it appears to refer to an object, often in the plural, asherim, and sometimes seems to be simply a female name, but always it’s intimately associated with devotion, even adoration, of a forbidden sort. It’s not a huge leap to conclude that asherah was a feminine deity, and one who was worshiped by “heretics” in ancient Israel. The first mention of her in the Hebrew Bible is in Exodus, when Yahweh makes his covenant with Moses on Mount Sinai. God commands the Israelites that when he’s driven the Canaanites out of the Promised Land, “You shall tear down their altars and break their pillars and cut down their Asherim (for you shall worship no other god, for the LORD, whose name is Jealous, is a jealous God).” (2) Cutting down “Asherahs” implies she was symbolized as objects. But why are we only discovering the truth about Asherah worship now? Why has it taken millennia for the Hebrew goddess to be acknowledged? When the Hebrew Bible was first translated into Greek, Latin and English the meaning of the word asherah was unknown. Because of its association with sacred places and trees, the 2nd-century BCE Greek Septuagint translated asherim as “groves,” which passed into the Latin Vulgate and then into other translations such as the King James Version – and onwards into every Protestant denomination. As far as the average church-goer was concerned, if they even noticed the relevant passages, they shrugged them off. Who cares about some weird tree fixation? And there the matter rested for over 2000 years. The puzzle was finally solved in 1929, during excavations of the ancient Canaanite city of Ugarit - modern Ras Shamra - on Syria’s Mediterranean coast. In the ruins of the Temples of El and Baal they unearthed hundreds of clay tablets dating from the 14th century BCE that depicted their myths. Naturally many of them referred to the Canaanites’ supreme god, El, but there was something else… A previously unknown goddess appeared alongside the great god El: Asherah, the supreme female deity of all Canaanite deities. So far from being literally made of leafy stuff, asherah turns out to be that most unexpected of beings, a Canaanite goddess. Her existence certainly explains the Bible’s charges of apostasy back in the old days, while there were pockets of Canaanites still around. And it explains why she was paired with Baal, and why the Hebrew Bible repeatedly warns the Israelites off her worship, just as it did with Baal’s. Since 1989, Lynn Picknett has researched historical and religious mysteries. Together with coauthor Clive Prince, she has written such bestsellers as The Stargate Conspiracy and The Templar Revelation, which directly inspired The Da Vinci Code. A frequent speaker at conferences around the world, she regularly appears on TV series such as Forbidden History, History’s Ultimate Spies, and Medieval Murder Mysteries. She lives in Surrey, UK. Since 1989, Clive Prince has researched historical and religious mysteries. Together with coauthor Lynn Picknett, he has written such bestsellers as The Stargate Conspiracy and The Templar Revelation, which directly inspired The Da Vinci Code. A frequent speaker at conferences around the world, he regularly appears on TV series such as Forbidden History, History’s Ultimate Spies, and Medieval Murder Mysteries. He lives in London.